Gran Canaria offers year round windsurfing, SUP, surfing and kayaking at Bahia Feliz. check out the spot video showing the conditions for all levels at Bahia Feliz and advanced windsurfers can head up to the world cup beaches in the north. Newly Featured 5* Tamarindos Hotel and Spa and choice of accommodation. There is a choice of budget self catering apartments and family all inclusive hotels within walking distance of the sports centre at Bahia Feliz and nely feature luxury 5* Tamarindos hotel with spa and kids clubs. The 2*+ Tres Vidas apartments offers 104 rooms with balcony/ terrace and amazing views. A resort ideal for families, groups of friends and couples. Only 75 metres from the beach they share facilities with the Hotel complex they are situated within. 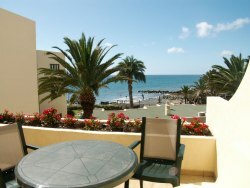 Hotel Monte Feliz is a good standard property overlooking the beach and approximately 5 minutes walk to the centre. There is a choice of studio, 1 and 2 bedroom apartments set around a pool. Ideal for singles, groups and families. A superb 5* luxury hotel option for windsurfing and stand up paddleboard holiday in Gran Canaria, with choice of room categories, 3 restaurants on BB, half board or All inclusive board basis, 3 bars and lounges, onsite gym, 2 pools, spa and beach. Just 5 minutes from the windsurfing area.